Country Living Hip Flasks at The Pocket Hip Flask Company UK. Welcome to our selection of Country Living and country themed hip flasks. Our range of fine English pewter and stainless steel country living hip flasks make great gifts for people who really love living in the country. Whether you live in the town or countryside you are sure to love our wide range of country inspired hip flasks. When people talk of country living the first things that come to mind are beautiful country scenes and nature at it’s best. We have a wonderful collection of country hip flasks including flasks with pictures of wild animals set against the backdrop of the beautiful English countryside. Of course country living is not just about the wildlife and country scenery but about the activities most common with living in the country. 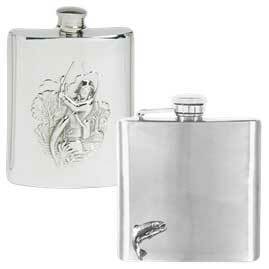 For example we have a wonderful range of shooting and fishing inspired hip flasks. This beautiful range includes our pewter fishing reel and pewter shotgun cartridge country living hip flasks. Our stainless steel country living hip flasks come in both the traditional rectangle kidney shaped and round shaped versions. Each of the stainless steel country living flasks have vibrant colour pictures of county scenes that really bring the flask to life. The back of these stainless steel flasks have room for some personal words that we can engrave for you. We have some round pewter scrimshaw hip flasks that have a cream resin disc on the front with a nice drawing of a country scene. These scrimshaw hip flasks were originally produced many years ago and used whale bone to make the badge. Of course we do not sell whale bone products and so our scrimshaw country living hip flask badges are made from resin. These country designs really do have a striking appearance against the highly polished finish of the pewter. We have some country living hip flasks that have country scenery and a pewter figure shown behind a glass panel set in the front of the flask. These round country living hip flasks show off the bright country back ground and provide a new element with the pewter figure that gives the scene more depth. 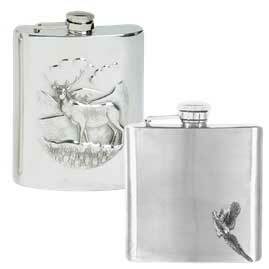 These flasks come with pewter stags, shotgun, fish, fisherman and a sporting shooter. 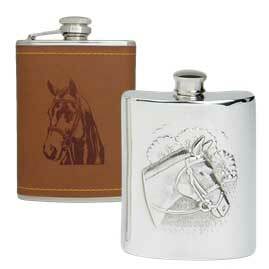 Our best selling country living pewter hip flasks are a selection of rectangle flasks that have an engraving panel on the front. 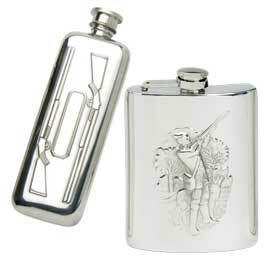 These great looking flasks have a country scene stamped in to the front of the shiny pewter flask. Each of these hip flasks comes with the option to have a captive or non captive top. Captive tops are great for people like me who might have a swig of their drink and forget where they put the top. I think we have covered all our country living hip flask but if you think we are missing something then please let us know.